WOOGLIN’S IS THE BEST PLACE IN COLORADO SPRINGS TO GET AN ITALIAN SANDWICH. 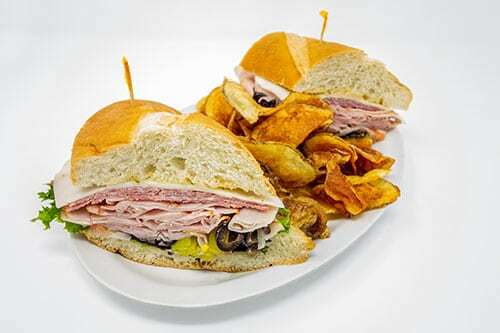 Our stacked Italian Sandwich includes salami, ham, provolone, lettuce, tomatoes, onions, pepperoncini, black olives & vinaigrette dressing served on french bread. Served on the side is your choice of house-made chips, veggies, or potato salad. I have been getting this Italian sandwich for almost a decade now. I eat one half for lunch, one half for supper. It is HUGE. I always get the veggies on the side.